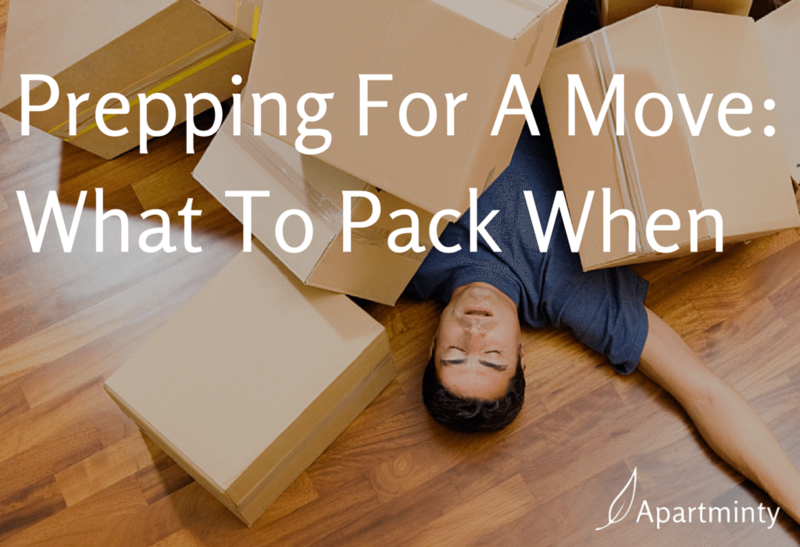 Figuring out what to pack when you are preparing for a move can be tad bit challenging. 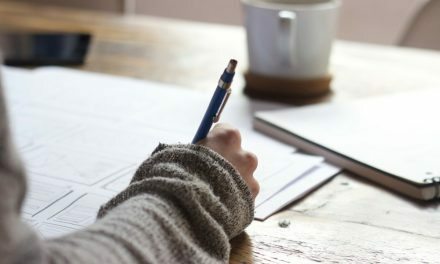 You don’t have to feel overwhelmed and you certainly shouldn’t try to do it all the week of (looking at you, procrastinators. We’re not judging, in fact we are on your team). 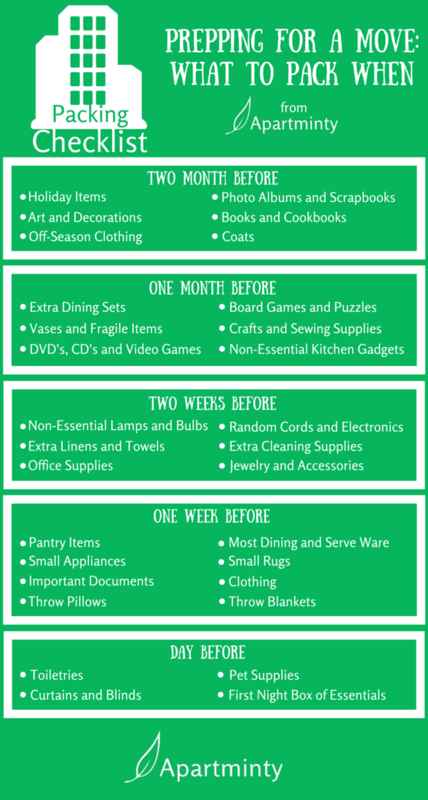 Use our two month schedule to help organize packing and ensure your belongings are all set by moving day. Holiday Items – Start packing up all ornaments, lights and blow up characters buried in the closets and garage. Art and Decorations – Take everything down hanging up on the wall. I know the visuals are nice but, while you’re preparing to move you will be all right without them. Photo Albums and Scrapbooks – Normally, you only pull them out during holidays anyway. Tuck them away to view later at your housewarming! Books and Cookbooks – Use this time to perfect the recipes you already know. There will be plenty enough time to learn new recipes after you move. Off-Season Clothing – Be sure to keep out the essential clothes but, pack up those attires you know you won’t need for the next couple of months. Coats – Keep out the in-season coat you will most likely wear and that’ll suffice the weather. Don’t pack up your trench coat when it’s still thirty degrees outside! Extra Dining Sets – Cook your last elaborate dinner and box away that china for a celebration in your new home. Now is the time to break out the paper plates. Vases and Fragile Items – Try not to become distracted with popping as you wrap these items in your favorite bubble wrap. DVD’s, CD’s and Video Games – Hang onto one or two of your preferences for now but, the rest can get packed away. Board Games and Puzzles – Tape up the games, puzzle boxes and any other form of entertainment you don’t use on a regular basis. Crafts & Sewing Supplies – I promise, you’re not going to have time to use them until you’re settled in your new place. Non-Essential Kitchen Gadgets – Things like that avocado slicer you’ve used once and the juicer you only break out when you decide you need a health kick can get packed up now. Non-Essential Lamps and Bulbs – Any lighting that is not essential to be able to see at night can be packed up now. If you have overhead ceiling lights, then you should be able to pack up all floor and table lamps. Extra Linens and Towels – Keep a towel and change of sheets out for each person in the household and simply wash and change out once more before the move; everything else can get packed up for later. Office Supplies -Keep out any items that you’ll need for the move: a couple of sharpies, pens, sticky notes and a roll of packing tape. Random Cords and Electronics – you know that box or drawer of cords you keep in case you someday remember what they belong to? That extra DVD player and old cable modem? Pack ’em up. Extra Cleaning Supplies – If you’re a bulk shopper, pack away all of the extras. You can also pack up less frequently used items like silver polish and car wax. Jewelry and Accessories – keep out a few of your everyday go-to’s but pack the rest. Seriously, you won’t miss them. Pantry Items – Any baking items, spices, canned and dried goods that you have not used up can get packed now. Small Appliances – Time to pack up the extra coffee machine, toaster oven, hand vacuum and humidifier. Important Documents – Keep out any documents you might need in the process of the move and put those in a file in your first night box. Throw Pillows – These make great insulation for boxes with delicate items! Most Dining and Serve Ware – Either keep out a set of one plate, bowl, knife, fork, spoon and cup for each member of your household or pack it all up and use plastic and paper for the last week. Small Rugs – If they’re decorative, there’s no need to keep them out. Clothing -Each member of the household should pack a bag of clothes for the week and box up everything else. Throw Blankets – If you’re a microfiber blanket junkie like Maddie, then you have way more blankets than you can use at any given time. Toiletries – Keep the essentials in the bag with your clothes. Curtains and Blinds – Unless there is a window where you absolutely need your privacy, you can survive one night without window treatments, and you’ll be so grateful for one less thing to do on moving day. Plus, you won’t be as likely to lose the hardware in the process if you aren’t as rushed. Pet Supplies – Keep out important medicines, a toy for comfort, and enough food for the next couple of days. Maybe a lint roller or brush, too. 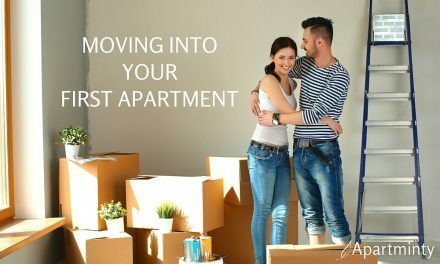 First Night Box of Essentials – It’s best to start adding items to this box a couple of weeks prior to moving day, but don’t seal it up until the last of your stuff is out of your old apartment. Not sure what should go in this box? We’ve got you covered. packaged foods plus much more plus more plastic products. conscious of their carbon footprint, solar power panels have received renewed interest among consumers. These pre-packaged solar panel kits include practically all that you need to build your individual renewable energy solution right in your garage or workshop.